Dr.S.B.Mujumdar is the Founder and President of Symbiosis – a multi-national, multi-lingual and multidisciplinary educational complex of repute. 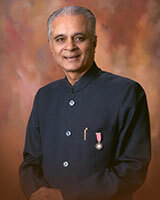 A distinguished academician and educationist, he is also the Chancellor of Symbiosis International University (SIU). Dr.Mujumdar was born on 31st July 1935 at Gadhinglaj, a Taluka in Kolhapur District in Maharashtra. He had his school education at Gadhinglaj and college education at Kolhapur and Pune. In his Master’s Degree (M.Sc.) in Botany, he stood first class with distinction in Pune University. He obtained his Doctorate (Ph.D.) in Microbiology from Pune University. He joined Fergusson College, Pune as Professor and Head of Department in Botany, a position he had held for 20 years. He was a recognized post graduate teacher and a guide for Ph.D. students. He was a member of Pune University’s Executive Council, the Senate, Academic Council (for 14 years) and Chairman of the Board of Studies in Botany (for 9 years). He was also I.C.C.R’s Foreign Academic Advisor in Pune University (for 7 years). Deeply touched by the hardships suffered by the foreign students – especially Afro Asian students – studying in Pune, he established in 1971 ‘SYMBIOSIS’ with a view to help them and provide them a ‘Home away from Home’. He soon realized that education is the best medium for promoting international understanding. He, therefore, started establishing educational institutions imparting quality instruction in diverse disciplines e.g. Management, Law, IT, Computers, Bio-Medical Science, Engineering, International Business, Geo-Informatics, Media & Communication, Photography etc. Presently, Symbiosis has 46 institutions and about 32000 students from all States of India and 85 foreign counties. The Ministry of HRD, Government of India, conferred upon Symbiosis in 2002 the status of ‘Deemed to be University’. Many Symbiosis institutions are ranked amongst the top 10 institutions in India and they have a placement record of almost 100%. Realizing the importance of distance education, Symbiosis has established, SCDL – Symbiosis Centre for Distance Learning – which conducts a number of on-line courses and has over 2 lakhs of students from India as well as many foreign countries. All Symbiosis institutions are generally need–based. These are run on and adhere to the best ethical practices. The Faculty is selected purely on merits and without considerations of caste, creed, religion or region. One of the unique institutions established by Symbiosis is SIMS – Symbiosis Institute of Management Studies (for Defence Personnel and their dependents) – which provides management education exclusively for children of Defence Personnel. Another innovative institution is the ‘Pune Police Public School’ managed by Symbiosis and which provides education to the children of Police Personnel. Apart from these academic activities, Symbiosis has also established a magnificent Dr.Ambedkar Museum and Memorial which houses the personal belongings and memorabilia of Dr.Ambedkar. It has also established an Afro – Asian Cultural Museum.